If you were in the vicinity of Chastain Park in Buckhead on Saturday, August 8, 2009, you would have witnessed a happy crowd of 400 plus people munching on plates of catfish, swigging down glasses of sweet iced tea and cokes, toe-tapping and hand clapping to the melodious sounds of three area bands. Sponsored by the alumni associations of MS colleges and universities, this was Atlanta's first-ever Mississippi in the Park. Modeled after similar events held in New York City's Central Park and The Mall Washington, DC, this event was more like a family reunion and certainly had that feeling as people clustered together in family groupings and mingled with fellow alums from the various schools represented: Alcorn State, Delta State, Jackson State, Millsaps, Mississippi State, Mississippi University for Women, University of Mississippi, University of Southern Mississippi. The event was sponsored by Coca-Cola Enterprises with a financial contribution and cases of Coke products. Farm-raised catfish from the Mississippi Delta was trucked in and prepared by Ken Akins from Madison, MS. Tom Aumbak brought canisters of their famous McAlister's delicious sweet tea and cookies. In true southern tradition, two of our best public servants - Ken Stewart, Georgia's Commissioner for Economic Development and Stacey Pickering, Mississippi's State Auditor - addressed the crowd. 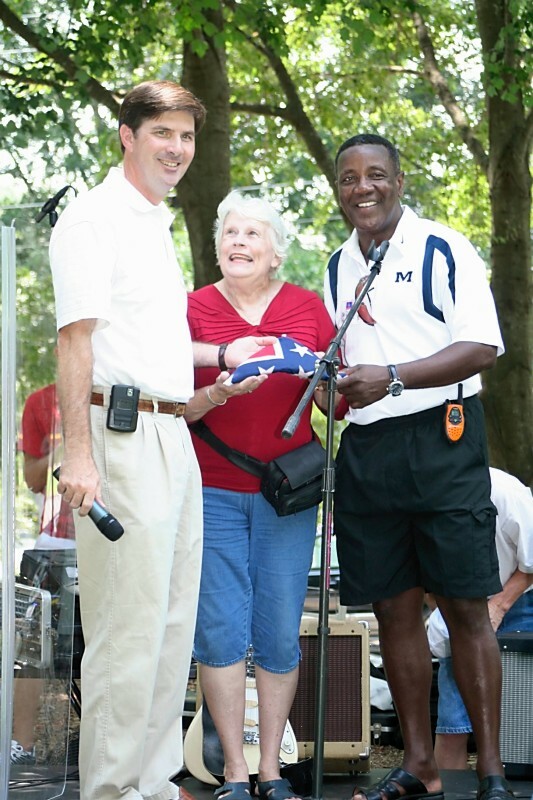 Mr. Pickering presented the Mississippi in the Park Committee's Chair, retired Army General and member of the Georgia Baord of Pardons and Parole, Jim Donald and Co-Chair Camille Yahm, a retired fundraiser with numerous non-profit entities, with a flag that had flown over the Mississippi State Capitol in Jackson, MS. Throughout the day, committee members Jenny Gipson and Ranetta Goss kept the crowd on the edge of their seats pulling winning raffle tickets and awarding prizes to the lucky people who held them. The prizes included a football autographed by the Falcon's first round draft choice from the University of Mississippi - Peria Jerry - and two tickets to the Falcon's opening game with Miami. Master of Ceremonies Stuart Yahm kept the crowd entertained while introducing the various celebrities and portions of the program for the day. What would a celebration of Mississippi be without music? Legendary local blues artist Chick Willis and his band recently returned from a tour with B. B. King and Bobby "Blue" Band. Another local blues band the Daddy-O's inspired a group of young ladies to dance in front of the stage. Young in age, but mature in harmony and presentation, the christian country band, Homegrown, thoroughly charmed the crowd with both their music and their message. An added attraction, and what became the centerpiece for taking photos in the park, was a beautiful vintage Model A Ford completely refurbished and decorated in the logo and colors of "Ole Miss" (University of Mississippi) owned by and driven to the event by Tad Provence, formerly from New Albany, MS. Not to be outdone, Kieu-Anh Tran, President of the Atlanta Mississippi State Alumni Association, paraded around the park two handsome Bulldog mascots for Mississippi State. At the end of the day it could be said that "a good time was had by all". Even though there will never again be a "first-ever" Atlanta Mississippi in the Park, there will be a second one next summer, and if this one was any indication, many more to come. Visit this web site (www.msinthepark.org) to keep updated about this and related happenings. 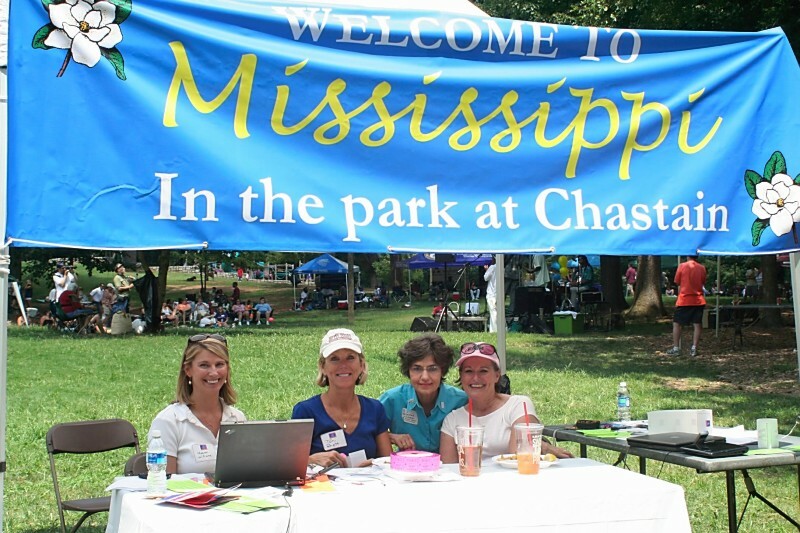 On behalf of the Mississippi in the Park Committee, we want to thank you for your great turn-out and support of the First Annual Mississippi in the Park Picnic and Reunion. For those who were able to attend, we are confident you'll agree that this inaugural event was a tremendous success! We thank our sponsors: Coke, McAlister's and the SpringHill Suites by Marriott - Buckhead. Without our sponsors, this event would not have been possible. We would also like to thank the bands that provided our entertainment: Homegrown, Daddy-O's and blues artist Chick Willis and his band. Check out some of the pictures submitted on the Photos link above.